Happy week 2 of the Gift Knitting Guide! This week's pattern is the Brooklyn Cap, a sweet little sport weight hat that is as cozy as it is cute. The pattern is 25% off through Friday, so grab it at only $3.75 from Ravelry, Etsy, or my website. If you'd like to order a handknit Brooklyn Cap of your own, this wool/alpaca/mohair goodness will only cost you $60 (email me at megan@freesiafibers.com to place your order). Oh, and sidenote - if you liked last week's pattern (the Golden Wrap) & you'd like to order a handknit wrap, that one is only $68 thanks to its super bulky yarn (it's very quick to knit up, which keeps labor costs down). Hooray for gift knitting! Read on to learn more about the creative process behind the Brooklyn Cap, & get a few more snapshots of it & this glorious yarn. 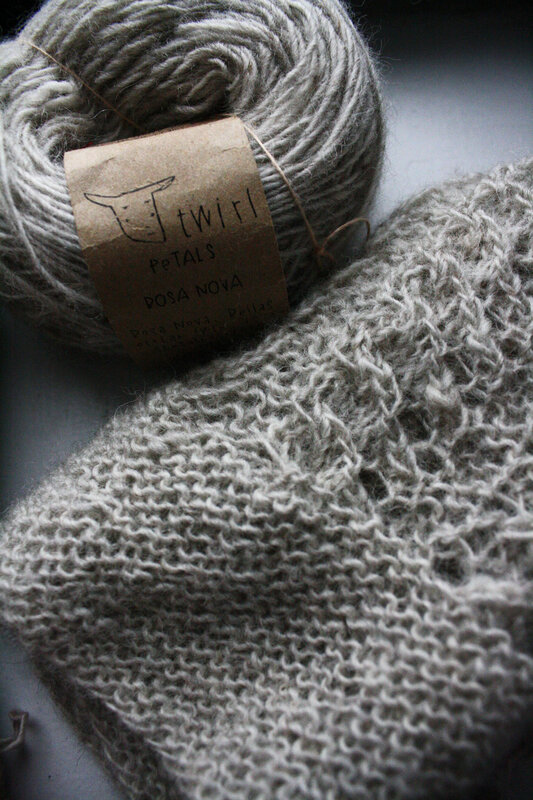 This hat was entirely inspired by the gorgeous yarn I found at Brooklyn General Store, Twirl Yarns Petals. It is a remarkable blend of wool, alpaca, & mohair, making it incredibly warm & also wonderfully soft. The mohair adds a slight little halo, accentuating each lofty little stitch. The Brooklyn Cap features a cozy garter stitch brim, which transitions into a simple lace & cable pattern that folds into itself to form the crown. It looks a lot more complicated than it is; the pattern is only a 6 row repeat (& 3 of those rows are knit rows!). It's easy to memorize, & great for TV knitting. It's got a bit of a slouch at the crown, but just a smidge - enough to be comfortable, but not enough to really be a beanie. Even though the lace opens up the fabric a bit, it's still incredibly warm thanks to the fiber content of the yarn. As I mentioned above, the pattern is only $3.75 through Friday, so snap it up at the reduced price while you can! And shoot me an email at megan@freesiafibers.com to order a handknit cap for only $60. Happy gift knitting!